Mix salt, red chili powder, turmeric, chaat masala and garam masala. Add lemon juice and marinate liver pieces using this mixture for 2 to 3 hours. Put oil in the pan and fry liver for 5 minutes till its color changes. Cover it for 5 minutes till the liver softens up. Remove cover and fry for another 5 minutes. Spicy pan fried liver is ready. Serve hot with mint chutney and chapati or naan. 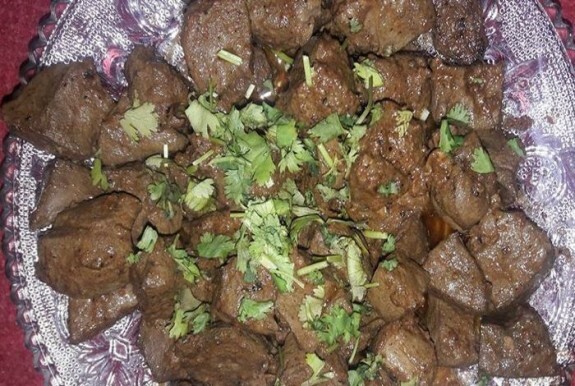 URDU RECIPE: Kaleji k pieces ker k salt, red chili, chaat msala, garam msala aur haldi add kerien. phir 2 lemon k juice add kr k mix karlien. 2 3 hours k liye rakh dien. Phir taway pay oil dal k garam krien, kaleji ko dal k fry krlien achi tarah, phir 5 mint k liye tawy py dhakn dy k kaleji gal jay.15 minutes mein ready ho jayay gi. 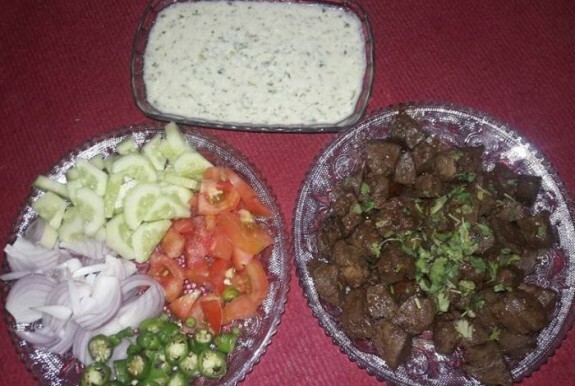 Mint chutney k sath serve kerien.